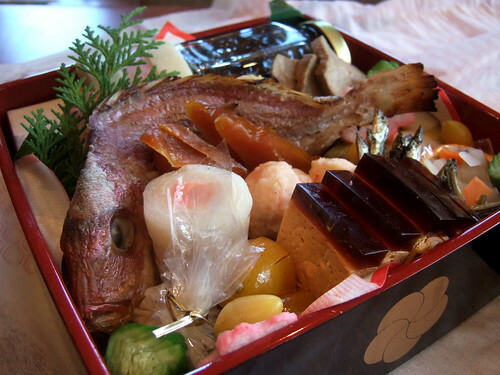 Photo: 重箱, jūbako, multi-layered box to serve food at New Year’s. 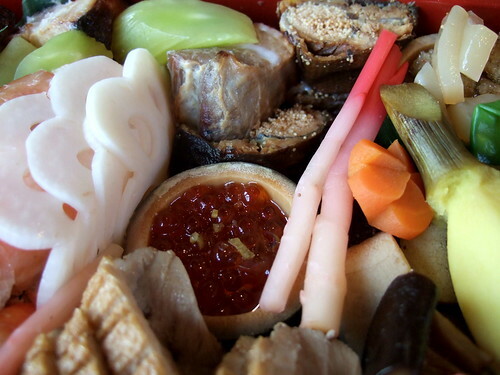 The jūbako is like a Ph.D. in Japanese culture in a box, how to start? The oshinagaki (menu) lists 43 items, in Japanese, so there was some kanji dictionary work for the names. But nothing on the palate was completely unfamiliar, a lot of comforting friends in that box. A whole baby sea bream swam in a sea of preserved vegetables and fish. A jar of kuromame (sweet cooked black beans) was nestled one one side, like grandma had sent over her blue-ribbon preserves. 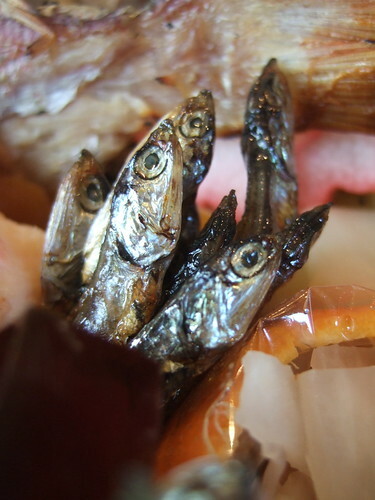 To fully appreciate this bounty one must study the traditional meanings of the foods, the name puns (see below), the visual appeal and arrangement, the complex recipe preparations, the history of foods that have been eaten since ancient times (black soybeans, sardines) and the modern additions (black pork, beef). And then you just tuck in. Photo: Top layer, 22 different items, including sea bream, ankimo tofu (monkfish liver pate), smoked salmon wrapped in many layers of thinly sliced daikon, kuri kinton (chestnuts in sweet yam paste), kinkan mitsuni (kumquat that was sweet simmered), tataki gobo (smashed burdock root with sesame sauce), house made karasumi (preserved bottarga, i.e., mullet roe), red and white kamaboko (fish paste), kararashi renkon (lotus root stuffed with mustard, ginko nuts, and more. 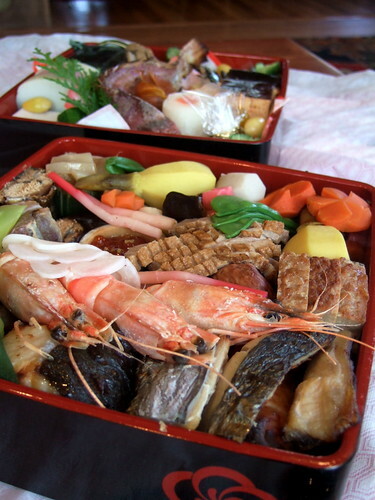 Arrangement of the food: The top layer of the box actually has two layers of food, laid out in a traditional format of celebratory foods on top, with a second layer of preserved foods beneath, the second box having the third and fourth layers of seafood and meats and then stewed vegetables. The visual appeal of the box is heightened by the names that are puns for good luck and success in the new year. Photo: Bottom layer, 21 items, which included winter Spanish mackerel yuan yaki, black pork belly miso yaki, chicken balls, house made datemaki (a fish and egg sweet omelet), sabazushi (a pressed mackerel sushi), salmon roe in a bamboo cup, and much more. 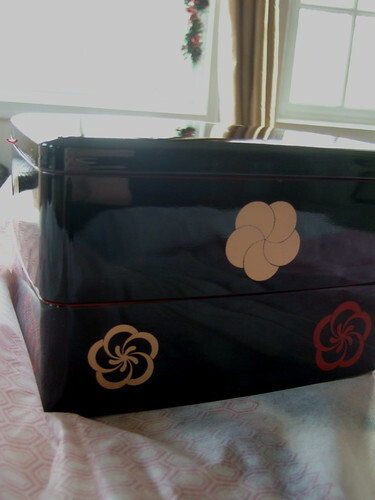 Japanese culture near Washington, D.C.
Japan-America Society of Washington D.C.
Wow, you had really nice osechi…. in DC!! Looks really good. We really enjoyed it. What a treat. We are doing a Japanese dinner that won’t look anything like that…unfortunately…Can you share your pickle recipe and maybe a soba soup recipe. I have the noodles and the base….